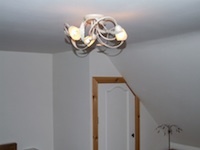 At Solas handyman services we can replace light fittings as well as switches and sockets. We can add additional sockets to a room or put lighting in your decking. Full house re-wiring also available.